The spectacle of a major political party practicing undiluted democracy on live television contributed to the longtime popularity of Prime Minister Binyamin Netanyahu and his Likud. On Tuesday, Feb. 5, nearly 70,000 registered members from all walks of life up and down the country turned out to choose their preferred list of candidates to run for the 21st Knesset on April 9. Most other Israeli parties, especially the newcomers, are essentially one-man shows, excepting the opposition Labor, which too shows signs of giving up on the democratic process. They are led by “stars,” most of whom are fashioned and manipulated by the armies of publicity “experts” swarming over national politics in recent years. They seemed to fit the mood of an electorate eager for change. But, then, the Likud primary presented a different reality. 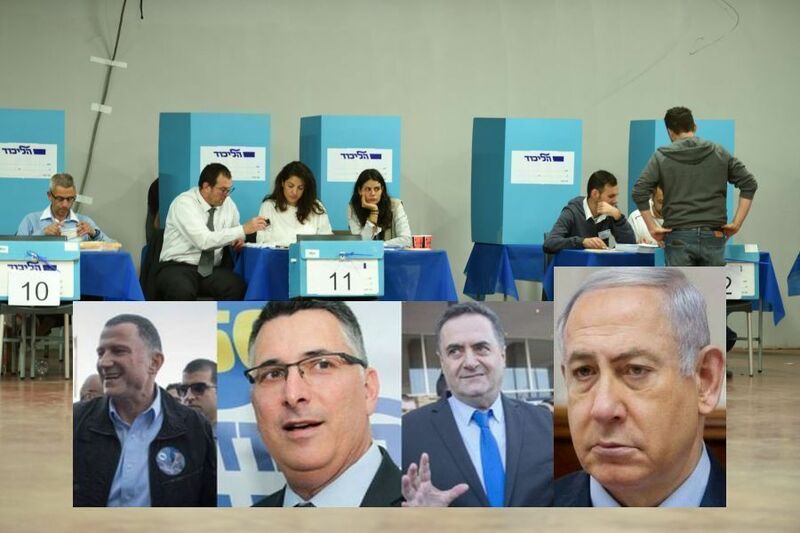 Its rank and file lined up at the polling booths, each with strong views on which politician deserved to be ranked in the top ten of the slate for the next Knesset. Their choices were highly representative – a mixed bag, compared with some other parties, whose leaders are picked from social, religious or military elites. Knesset Speaker Yuli Edelstein and Transport Minister Israeli Katz were vying for top spot in the Likud’s Knesset list for the April 9 election, after a 75pc tally of the party’s primary results. Gideon Saar, longtime opponent of Prime Minister Binyamin Netanyahu was a close third, followed by Public Security Minister Gilead Erdan, Culture Minister Miri Regev, Tourism Minister Yariv Levin, new party member Yoav Galant, MK Gila Gamliel, former Jerusalem mayor Nir Barkat, in his debut in the national stakes, and Avi Dichter, Chair of the Knesset Foreign Affairs and Security Committee. Some old-timer Likud stalwarts dropped to the second 10 spots, including Ministers Yuval Steinitz, Tzachi Hanegbi, Zeev Elkin, Tzipi Hotoveli abd Ofir Akunis. The high ranking awarded to Gideon Saar, a former education minister who took time out from politics for four years after disagreeing publicly with Prime Minister Netanyahu, was a salutary message from the Likud rank and file. He was given to understand that although he is unquestioned party leader, the Likud does not hold with a personality cult or offer blind following. A diversity of views in opposition to the prime minister is healthy. The outcome of the primary election shows that the prime minister has come out strengthened from two or more years of relentless political assaults based on ongoing police corruption probes against him. He now faces two tough challenges: the legal battle against prosecution and the April 9 general election against still amorphous opponents. He praised the Oslo Accords and Israel’s unilateral disengagement from the Gaza Strip in 2005 under the premiership of Ariel Sharon and recommended using it as a model for other areas. When pressed on his partner Moshe Yaalon’s opposition to the Oslo Accords and the Gaza Disengagement, Gantz appeared to defend both. “The central question is a security question,” he said. “The [Gaza] Disengagement was carried out based on the State of Israel’s policy concerns. All the sides involved got high scores for the ability to not tear the country apart. The truth is that disengagement from Gaza tore the country apart as almost never before and the IDF and settlers, far from working together were in bitter conflict throughout. The evacuees were unforgiving and officers who carried out the forced eviction of 8,000 Israelis from Gaza still bear the scars of that traumatic event. Gantz, as chief of staff, should have known all this. This “rewrite” of the new politician’s stumble came too late to cancel the campaign gift their leader had presented to Likud and its rightwing allies. Observers remarked the Gantz’s verbal inadequacies when speaking off the cuff in an interview, compared with his polished phrases when delivering a prepared speech. If Gantz, thinks the surrender of Gaza and the naive Rabin signing the Oslo Accords were good for Israel, then G-D forbid he should ever be Rosh Memshalah. More Jews have died in three mini wars in Gaza, then when we Jews lived there. More Jews have died in acts of terrorism since the Oslo Accords were signed then in the previous forty-six years. It is all over for him. Nobody agrees that any agreement or disengagment produced benefit to the nation, only gave Israel, increased hatred, pressure, antisemitism, Arab hostility, International scorn and left all our enemies demanding more. No one wants a Gantz leading the country, or a Leftist , or a compromised, ideologically infected misfit. GANTZ OF GANTZ what a plunder. You never learn the Arabs want to take every drop of Israel blood. Just to remind you Israel is a God covenant nation. The land on which the children of Israel sits is God’s. And history shows there is a price to pay for everyone who give this land back to God’s enemies. You just paid the price because you will never be Israel leader. Go back to God and seek repentance and forgiveness. David always did!. Read also the old testament prophecy books to understand about God’s plan of redemption and Israel. Bibi rules. He is in the same line of great Israeli statesmen. And the reason he has served this long is that no other elected officials of the same caliber showed same traits. Israeli voters are very engaged, they learned from past mistakes, and they know what is best for the country. They are NOT like the sheep in other countries (including US). They also know that he remains the best choice. Rock on!! We here in the USA elected Donald Trump-perhaps the greatest President ever. We are not all sheep. His State of the Union speech- mostly written by Stephen Miller- was a great one and will win the Republicans big time in 2020. Bibi Netanyahu will win …because he is suppose to win just like Trump will win ! They go together to keep and defend peace. DJT may be great at home and at least recognised Jerusalem as the capital of Israel but everyone knows that he is impetuous and a potential wrecking ball to the carefully connected 200 US bases around the globe because his overall straegy for the US is isolationism. He puts America first and that is why he wants to pull out from NE Syria and does not care about the Kurds who won the war on the ground against the proxy of the former US administration, ISIS. He is more interested in going to war in Venezuela. We also know from Eziekiel 38 and 39 that when the Russian coalition attacks Israel only Tarshish (UK) and her former colonies, plus Saudi Arabia, Yemen and the Gulf states will protest verbally, but not militarily. The US is no where to be seen in that prophecy, even though all the prophets were very accurate at describing coming empires using the symbolism of various kinds of beasts. So for crying in a bucket, Israel needs to prepare for the time the invasion happens, which will take place soon towards the end of the total destruction of Syria (Isaiah 17). See also Zechariah 2. Can’t wait to see Bibi reelected and things go back to coolness and steady advances. Who repairing his watch when ticking right? Only the 5th column is doing this destructive “repairing” Down with the Gantzes and his likes.